Carlee finished her CD with two qualifying scores at the Steel Valley cluster on 7/31 and 8/1/08. We are pictured above with judge Pat Krause on 8/1. 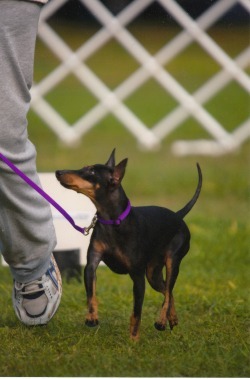 Carlee earned her first CD leg with a 183 1/2 and third place out of the Novice B class at the Nita Nee Kennel Club Obedience Trial on 7/18/08. We are pictured above with judge Nancy Withers. Carlee finished her RAE with two scores of 96 and two second place ribbons under judge Rick Garvin on 6/12/10! Carlee earned her second Rally Novice leg at the Southwest Obedience Club of Los Angeles trial on 8/12/06 with a score of 96 and 3rd place under judge Kay Ford. See a video of this run here on YouTube. Carlee earned her first Rally Novice leg with a score of 97 and 2nd place from a huge Novice B class at Summerfest her very first time in the obedience ring! She is pictured above with me and judge David Maurer on 7/9/06.